It is common knowledge nowadays that a computer keyboard can be dirtier than your average toilet seat. The question is: Is your computer keyboard one of them? If you do not believe what I’m saying, below are actually studies conducted over the years regarding the “cleanliness” (or should I say “dirtiness”) of your computer keyboard. A study from the Royal Society of Chemistry (RSC) in the UK confirmed that real live mice tend to leave their droppings on computer keyboards in offices at night. The reason why the mice are there? Well, they diligently reach in between the keys some food crumbs left by people who eat their food while working. You know how unsanitary mice can be – they eat and they don’t care where they leave their droppings. I assume most of you may be familiar with the MythBusters on the Discovery Channel. On their 135th episode (December 16, 2009) entitled “Hidden Nasties”, they have conducted a study based on the myth stating that there are some common household items which are dirtier than a toilet seat, in terms of type and/or the number of germs they carry. The results have confirmed that a computer keyboard really harbours more bacteria than a typical toilet seat. It doesn’t matter if you are the only one who uses your own computer or if you have one of these fancy backlit keyboards mentioned by DotBeasts. Major reasons for the dirtiness of a computer keyboard are people not washing their hands after using the toilet and eating food at their desks. If you tend to eat food while using your computer, your sticky fingers will most likely transfer sauces and edible substances onto and between the keys. Also, your fingers normally produce oils and they transfer to the keys whenever you press them. The oils in turn attract dust and/or become a nice place for germs to grow, multiply and transfer again to us, thus the higher chances for getting really sick. In case you didn’t know, the very first known report of a viral infection spread by means of computer keyboard and mouse equipment happened in May of 2008 at a Washington, DC elementary school in the United States. The sharing of computer equipment amongst students had caused the “norovirus” outbreak. Noroviruses are a group of viruses that cause symptoms such as vomiting, diarrhea, nausea, stomach cramping as well as food poisoning. This goes to show that routinely cleaning and disinfecting shared computer equipment, most especially in school environments and offices, is very important. Have you ever heard of “Qwerty Tummy”? It refers to a nasty case of food poisoning acquired from the use of an utterly dirty computer keyboard (where the word “qwerty” was derived). Symptoms are similar to that of noroviruses. Shockingly, you can also contract flu from a computer keyboard. People who have viral influenza often sneeze or cough, leaving behind droplets on hard surfaces, and a computer keyboard is no exception. The influenza virus can usually last up to 24 hours on hard surfaces. Shut down your personal computer and unplug it. Also, unplug your keyboard and mouse. Wipe the surfaces gently with a soft cloth. Slightly dampen (not wet) the cloth with a little amount of water or a standard cleaning fluid for computers. Turn the keyboard upside down and tap out any loose dust, lint or food crumbs. Clean the keys with disinfectant alcohol wipes. Get a vacuum cleaner. Use compressed air in short bursts to blow off dust and dirt. Never use a cloth to wipe down internal computer components. You’re right, I clean my own keyboard (at home) lot too. But of course, we never can see how many germs are hidden.. so twice a month, I always try to thoroughly clean it. It’s a good thing that when I worked in the office for my first job, we were given an alcohol bottle each to keep our hands and keyboards clean. I just hope every one of us DID use them. 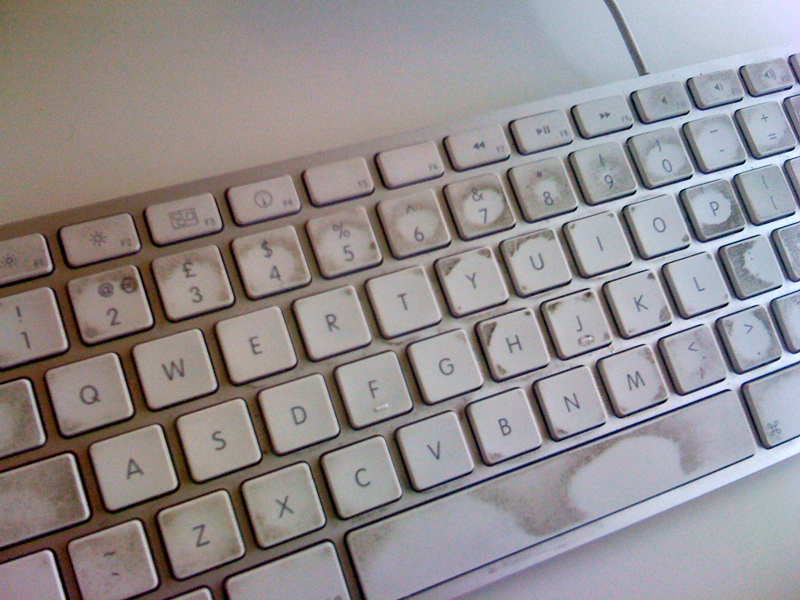 Emily @ TechPatio recently posted… How to Thoroughly Clean your Keyboard – and Why! Wow, that’s new. I always thought computers only harbor digital viruses. Turns out both digital and physical viruses thrive on computers. 🙂 This post made me take a second look at my keyboard. Gotta buy a small vacuum cleaner just for my keyboards. Yes, we must not overlook the “physical viruses” that grow on our computer equipment, especially the two things where we always put our hands on, the keyboard and the mouse. Why don’t you try to find a liquid cleaner designed for computers too? Vacuuming is one of the good ways to keep dirt off, but of course, wiping surfaces would be more effective to eliminate deep-seated dirt. Great post and very helpful. It’s smart to start out with unplugging the computer. Even though it seems like common sense to some, it is probably the one step overlooked most often. I actually have a friend who shocked himself pretty bad doing this exact same thing because he left it plugged in. Thanks for the information. But I’d never thought about the fact that if you eat Cheetos for breakfast at work every morning, those crumbs are going to be food for – SOMETHING. Yuck! So I’ll be sure to clean my keyboard. Thanks for the great post! Christie recently posted… Two heads actually ARE better than one- if both are competent and communicate! You know what, I just cleaned my laptop’s keyboard buttons. Ahhh, I should have one brush to this all the time. It takes not more than two minutes to be done, but still. I think it’s one of fact that human being just not see the real dust in front of day to day use things, till one points towards it. Yes, this one is really true. Thank You for sharing this one. Now, cleaning my keyboard will not be that difficult. I am the one who has individual work station where no one touch my computer rather than me. Dust and droppings from food are most common where people don’t think to care of and don’t clean It for long time which result in dirty keyboard. While cleaning the keyboard make sure that the cleaning solution does not get deep into the grooves between the buttons. If it gets inside, the keyboard buttons may start malfunctioning. Previous post: Outsource all your video work?